The door combines light weight with a unique vertical loading system, enabling it to be rapidly hung and adjusted. The Statesman APD features clean, sleek lines and can be exactly colour-matched by anodising or power-coating to suit a home's exterior. With door sizes up to 1200mm wide and 2400mm high, custom sizes and configurations are available upon request. Stegbar's new Statesman Aluminium Pivot Door (APD) has been developed in response to preferences for contemporary, wide-style doors. 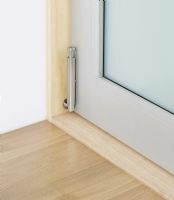 Stegbar developed the Statesman APD in response to preferences for contemporary, wide-style doors. Stegbar's new Statesman Aluminium Pivot Door (APD) combines light weight with a unique vertical loading system, enabling it to be rapidly hung and adjusted. It is the first entry door in Australia that can be installed in less than half the time of a comparable timber pivot door.